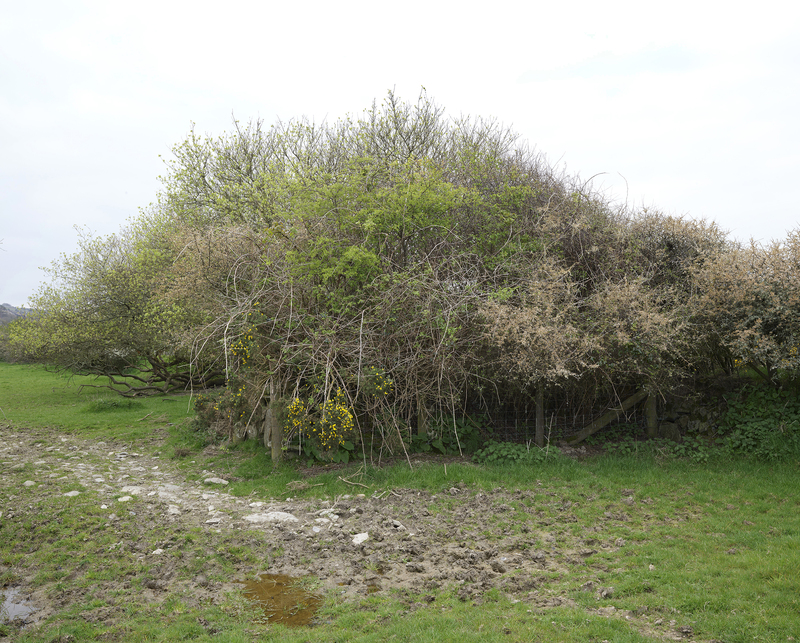 Conventional wisdom suggests Ancient Britain was dominated by dense Hansel and Gretel style forest. But the myth of the dark scary woods is being challenged by new research that suggests large swathes of the landscape supported open ‘savanna like’ grasslands and thorny scrub trees. ‘Scrub’ trees that have become ‘cultural outcasts’. Outcasts because they don’t comply with the economics of agribusiness or the aesthetics of the landowner, ‘Middle England’ or town planner. 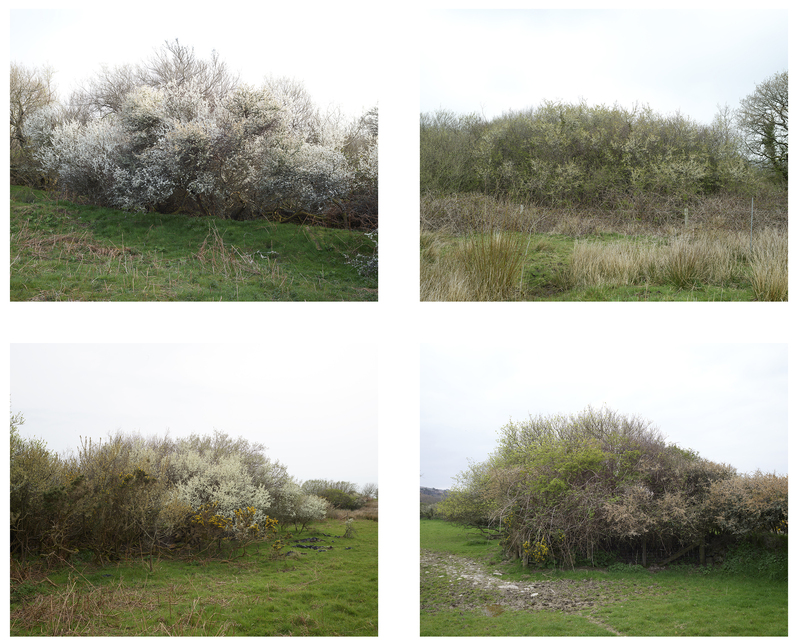 Our Hawthorns, Blackthorns, Wild Pears, Goat Willows and so many more beautiful flowering natives have been forced to the margins. Confined to hedgerows and pockets of land no one wants. And yet, these trees create the richest habitats for birdlife and insects and may offer the best hope of coping with the increasing impacts of climate change. As Isabella Tree suggests in Wilding: The return of nature to the British farm, 2018, ‘we have become a nation of gardeners, more interested in exotic flowers than native trees’. Here at Ffynnonofi, where I live and work in West Wales, the Hawthorn is one of the defining trees. Described by my Italian friend Hugo as ‘the olive tree of the North’, this hardy species has endured the salty winds that come off the sea for centuries and is at the heart of Celtic mythology. 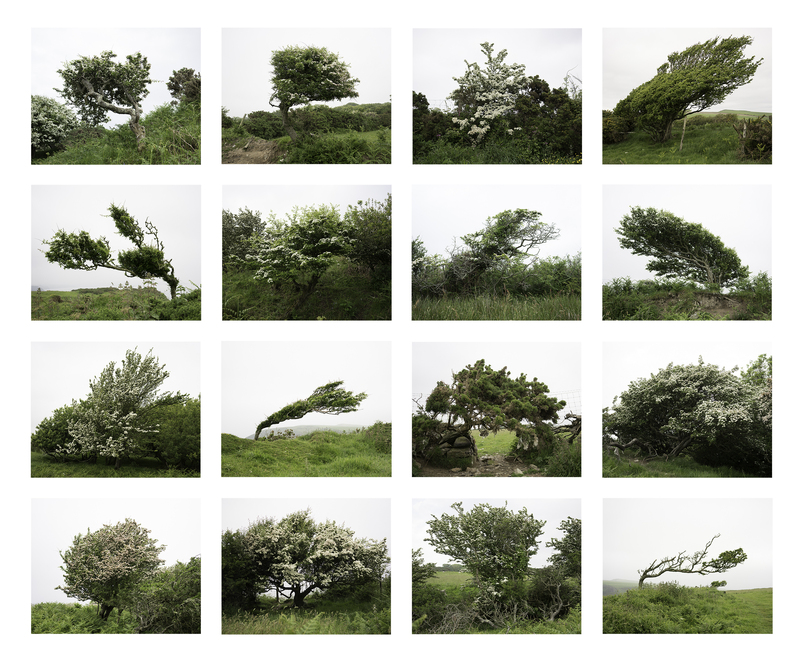 Their twisted and distorted trunks often defy gravity and tell us everything we need to know about the power and direction of the prevailing winds. Their tight foliage provides cover and habitats for numerous species. In late April, the trees become covered in white or pink blossom. It is the sign that spring has turned to summer. And in late autumn the tree is a mass of red berries providing food for birds. In recent years the berries have become more abundant. This isn’t due to our warmer summers but to the fall in the number of birds. According to the RSPB, many of our native bird populations have declined by over 80% since 1970. 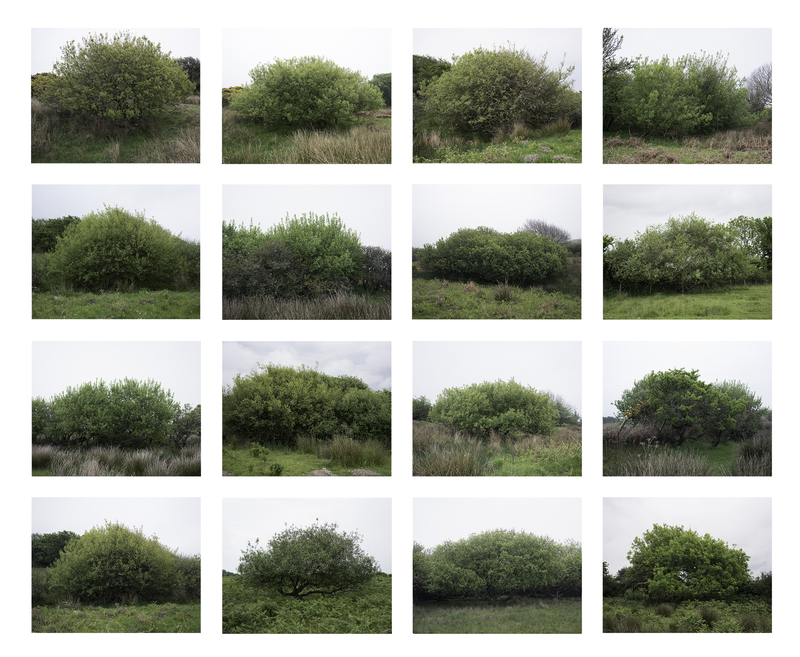 I decided to make a photographic record of the Hawthorns as a way of making work about place and to leave some record of the natural fauna for future generations. I have decontextualised them from their surroundings, like Bernd and Hilla Becher did with their industrial structures, and presented them in a grid in order to emphasise their wild sculptural forms. Just as the Bechers wanted their work to encourage the preservation of the industrial relics they photographed, I’m keen to record our natural living architecture whilst it still exists. It’s as much a topographical inventory as it is a pictorial document. I also made a grid of sixteen wild willow trees that thrive in the wetter parts of the lower fields. They are the complete opposite of the angular fierce Hawthorns. Something attracts me to these sensuous delicate leaved bog lovers. Maybe it’s because they are regarded as ‘weeds’ by many farmers and gardeners, or maybe it’s their pale green semi symmetrical round forms that appeal to my minimalist tendencies. Richard Mabey, in his book Weeds : The Story Of The Outlaw Of Plants 2012, talks of the extraordinary benefits and properties of weeds and what he describes as ‘outlawed’ species. Willow bark, for example, contains natural aspirin and was used for aches and pains and inflammatory conditions by our ancestors. This project reflects a passion I have developed for these ‘outcast’ trees and a desire to record their presence in a time of great uncertainty in the natural world. Nature has always been in a state of transition but the transition we are now talking about looks increasingly like extinction for many species. As Olafur Eliasson demonstrates in his serialised images of Iceland, the grid doesn’t have to be a form of urban order. It is also a way to express ideas of time, place, change and potential loss in nature. I’m also interested in giving significance and a presence to the stuff that culture marginalises or rejects or simply doesn’t notice. Depictions of forests in the european art tradition have mainly emphasised verticality or denseness or in Thomas Struth’s case, ‘Paradise’ is somewhere far off in exotic rainforests. 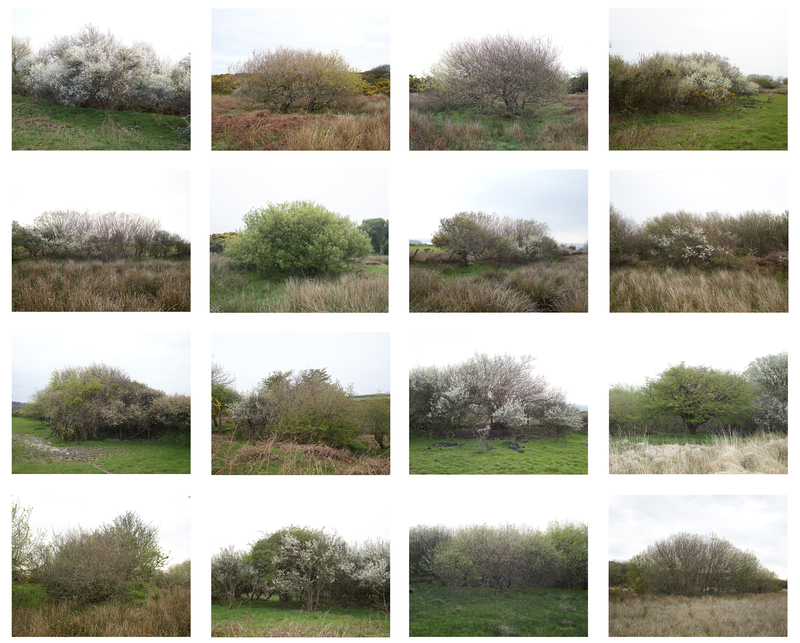 For me, these scrub trees in West Wales, which light up the hedgerows for a few weeks every year provide a sense of optimism without pointing to any utopian solution.